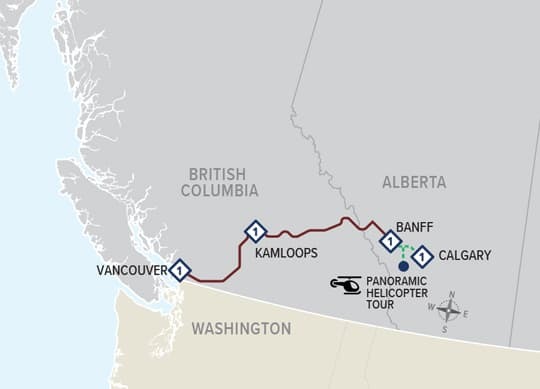 The First Passage to the West Excursion, our most popular short package, includes two days on the Rocky Mountaineer, one night in Banff National Park, a tour of Banff, helicopter flightseeing and a night in Calgary. 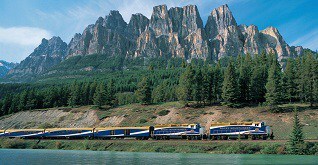 This package, like all Rocky Mountaineer packages can be customized with additional nights in the Rockies, a rental car for exploring Banff and Lake Louise which is only 35 miles from Banff and airport transfers in Calgary. If you have a limited time and want to make the most of your trip to the Canadian Rockies, this is the way to do it. In 2019, this package is renamed the First Passage to the West Excursion. In 2017 it was named the Canadian Rockies Excursion. Alcoholic and nonalcoholic beverages are included.